This extremely large set of data was truly a pleasure to work with. I am now, more than ever, convinced that one can never have too much integration time. Even though the surrounding Integrated Flux Nebulae and shell structure of the faint outer halo of the galaxy is plainly visible, no noise reduction was applied to the image at all. Another thing that greatly helped with the processing was that I chose to do the majority of the work in PixInsight 1.8. I had for years been using the old demo version, PixInsight LE, mainly for its powerful gradient removal feature (DBE), but I must say that switching to the full suite of PixInsight tools has really taken my image processing to a new level. I look forward to continue learning and improving my techniques with this great piece of software. 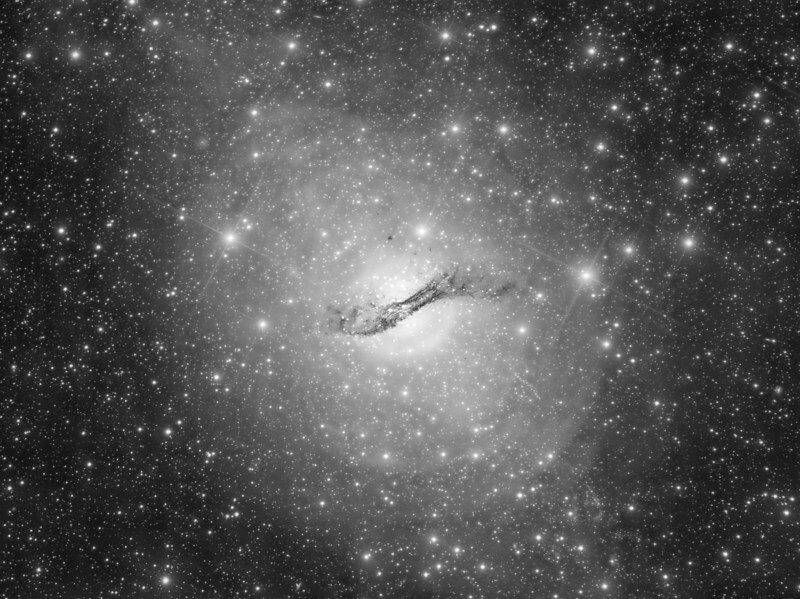 The entire halo of Centaurus A is seen here as consisting of concentric shells which are remnants of past mergers with other galaxies. The formation of such shells are a common observation in computer simulations of merging galaxies. The shells form when the cores of merging galaxies orbit around their common centre of mass in an ever tighter orbit while disrupting the halos of both galaxies and sending billions of stars into eccentric orbits. This process creates outward travelling density waves until the collision eventually settles as one single larger galaxy. Link: Click here to see a comparison of jet details with a 50 hour image from MPG/ESO 2.2-metre telescope at ESO’s La Silla Observatory in Chile. The Deepest Astrophoto Ever Taken with Amateur Equipment? The FITS file was astrometrically solved and magnitudes calibrated against a white star (USNO-B1.0 0470-0346877). Subsequent magnitude readings from Maxim using aperture photometry show plenty of stars below magnitude 25 with the faintest recorded at magnitude 25.45. Specifically magnitudes of 25.03, 25.12, 25.22, 25.42 and 25.45 were read from point sources just in a small area around RA 13 26 54 Dec. -42 50 45. The results seem to confirm that this Extreme Deep Field image surpasses the previous record made by Ken Crawford and Johannes Schedler's 2007 image of quasar CFHQSJ1641+3755 (Mag 24.80), and also the 2011 deep image of quasar QSOJ1148+5251 by Christian Sasse. Link: Click here to see detailed magnitude readings. Link: Click here to see a gallery of distant background galaxies in this image. According to the SIMBAD database there exist 883 catalogued globular clusters in the halo of Centaurus A, as of 2013. The first 80 globulars were found in the 1980's, and the rest has only been discovered recently in 2004 and later years. It is believed that these globulars only represent about half the total population and a further 833 new globular candidates were identified in 2011. In this extremely deep image I have been able to identify 709 (87.5%) of the 810 currently catalogued globular clusters that fall within the field of view. Link: Click here to see a version of this image with 709 globular clusters marked. Centaurus A is a peculiar galaxy located around 11 million light years away in the Southern constellation of Centaurus. It is the closest active galaxy to us and one of the most studied in the sky. The true nature of the galaxy is a matter of scientific debate and its type has been classified as either a lenticular or giant elliptical galaxy. The prominent dark obscuring dust lane is believed to be the result of a recent merger with a smaller spiral galaxy. This collision also likely triggered the intense star burst activity resulting in the distinct blue glow from bright young stars around the area of the dust lane.